The demolition of a community hall in the Joe Slovo informal settlement in Langa by the City’s Anti-Land Invasion Unit on Tuesday has resulted in the destruction of a pre-school and left the community confused and divided. 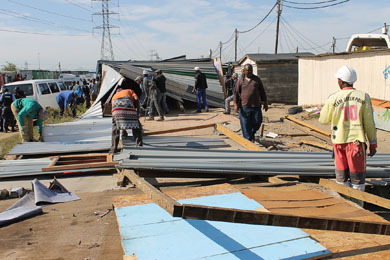 On Tuesday morning five Anti-Land Invasion Unit vans arrived in Joe Slovo and proceeded to demolish a community hall made out of zinc that had been standing for about ten years and was used by the community for a pre-school, public meetings, church gatherings and emergency shelter in the wake of shack fires. Although the Chris Hani pre-school is the only one serving Joe Slovo residents and housed about 200 children, the unit members told residents the hall was built on land identified as a road reserve. However, shacks built around, and on the same line as the hall, remained untouched. The incident has left residents speculating that community leaders who are refuses to step down despite the wishes of residents, were behind the demolition as they claim they were responsible for the erection of the hall and thus have the power to take it down. Mzwanele Zulu, who has been a community leader since 2006, said the hall needed to make way for a housing project that was to deliver 2055 housing units. Zulu said an agreement with the owner of the pre-school that a new school would be built and parents were told not to send their children to school on Tuesday. The new pre-school has yet to be built by Zulu said parents who had no other option could send their children to the teacher’s house in the meantime. He said some other community leaders disagreed with him over the management of the hall but he was the one who organised for an NGO called Khaya Lam to sponsor the building of it. But residents said Zulu is only trying to prove a point that he is the leader of the Joe Slovo community, despite the fact that he no longer lives in the informal settlement since he received state subsidised housing in the N2 Gateway housing project upon whose steering committee he serves. Newly selected Joe Slovo community leader Sydwell Mavume said Zulu used his influence to call in the Anti-Land Invasion Unit. He said the community was never informed about the hall being destroyed and were surprised to see law enforcement in their area. “We do not have a problem with them removing the hall but they should have found us another place to build a hall first before removing it,” said Mavume.